But the firsts don’t stop at the change in location. There was a change in the champion too. A Texas teen by the name of Jacob Buchanan edged out fellow junior Anna Weilbacher along with U.S. Army Marksmanship Unit’s George Norton and approximately 160 others with a winning total of 2391-129x. His first time at the NRA Nationals, Buchanan made quite the impression on the officials. Combining totals from the Metric and Conventional 3-Position Championships, It was Jeffery Doerschler, Michael O’Connor, Michelle Bohren, and Katie Bridges of team Blackhawk Mixed who walked away with a 9471-541x National Team Championship title. Share the post "Texas Teen Wins National Smallbore 3P Championship"
This Wednesday, July 23rd, on the Outdoor Channel, Shooting USA features End of Trail, the Cowboy Action World Championship. Hosted annually at the SASS Founders Ranch in New Mexico, End of Trail attracts nearly 1,000 shooters, hailing from 50 states and many foreign countries. SASS, the Single Action Shooting Society, is one of the most popular shooting organizations on the planet, having issued over 90,000 member badges. For SASS members, End of Trail represents the Superbowl and World Series combined. This special Shooting USA broadcast of the 2013 End of Trail airs at 3:30 PM, 9:00 PM, 12:00 Midnight (Thursday) Eastern Time. This year’s End of Trail took place June 19-29, 2014. If you like multi-gun competition, you’ll enjoy watching Cowboy Action Matches. The top male and female shooters are experts with three kinds of firearms: Lever Rifle, Single-Action Revolver, and Shotgun (which can be a double-barrel side-by-side, or a pump, or even an 1887 lever-action). The guns must be originals or reproductions made prior to 1898 to be used in competition. A typical stage will require 5 shots from each of two six guns, ten rounds from the rifle, chambered in a pistol caliber, and 6 to 8 shotgun rounds. To give you an idea of the action you can see on Shooting USA, here is a video of past world Champion Spencer Hogland, aka “Lead Dispencer”. In this video, Spencer fires 24 rounds, with four guns, in just 12.81 seconds (look at the timer in lower right corner). 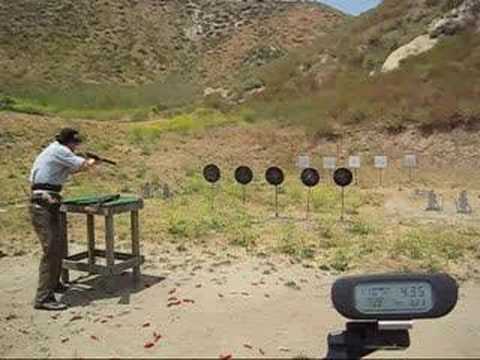 Spencer shows blazing speed with his lever gun and note how quickly he loads his shotgun. Fast loading is key to a successful stage run. Unlike modern multi-gun comps, normally Cowboy Action Shooters must start with empty shotguns. Share the post "SASS End of Trail Featured on Shooting USA"